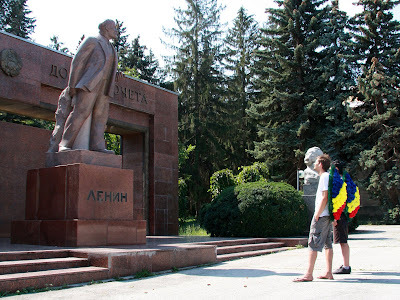 [Two funeral wreaths (80 x 60 cm, blue / yellow / red paper flowers, plastic thread) worn as backpacks between the statue of Stephen the Great in the proximity of the Republic of Moldova Government building, Lenin’s statue from the Moldexpo Park and the empty pedestal of a monument that was being restored in front of the History Museum in Chisinau, Republic of Moldova. This action makes an ironic re-evaluation of the ceremonial pilgrimage towards the places consecrated by public monuments. The authors also question the ritual gesture of placing flowers in front of these monuments. The overall intention is to underline the construct that lies behind the visual discourse specific to this means of communication through the use of which the political power shapes the collective consciousness of the population. The ritual set of gestures that these places imply, as well as the presumed adhesion of the viewer to this pre-defined set of gestures are also underlined. By wearing the funeral wreaths as backpacks of potential tourists, the possibility of an irreverent pilgrimage is created, one that can deconstruct the conventional gestures associated with this behavior, thus questioning the values that these places of memory communicate to the viewer. It is important to point out the fact that Lenin’s statue from the Moldexpo Park was removed from its original location in front of the Republic of Moldova Government building, where it stood during the Soviet period. Also, the statue of Stephen the Great was installed in a series of successive locations. Some of the displacements were due to the symbolic conflict between Soviet ideology embodied in Lenin’s statue, and Moldavian nationalist ideology. The last location of this action – the empty pedestal of the monument that is currently being restored in front of the History Museum – underlines the following observation: public monuments aim at rendering eternal a set of chosen collective symbols and values, but the statues themselves are temporary, mobile and unstable within the built space of the city. They are also continuously re-shaped and re-placed by the political power and by its ideological messages that it wishes to communicate to the population.